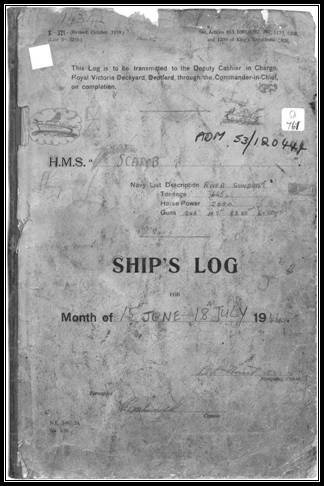 The following logs from HMS Scarab’s Mediterranean campaign are all that remain from World War II despite a comprehensive search. They provide a record from 15 June to 13 August 1944. 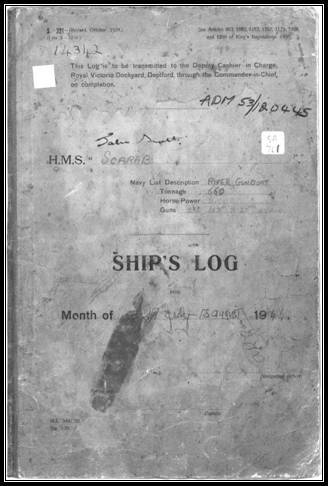 These logs appear almost like an accounting exercise in that they deal only with the basic nuts and bolts record such as distances travelled, location, ammunition count, watches, sundry chores and general routine. For example on the 17 June 1944 Scarab provided naval Inshore support fire in Operation Brassard (assault on Elba) with HM River Gunboats Aphis and Cockchafer. The log simply states “at sea” and records distance travelled per hour until 0300 hours. There is nothing further recorded that day apart from (temperature) until 2045 hours. The following day 18th June the record continues. It seems clear that the log had a low priority for the crew and officers. Combat action was not recorded in the logs. There is however another item mentioned in the logs and this is Punishment. On 26 June 1944 there is mention of “List of Defaulters”. Then from 4 July 1944 until 13 August “Men under Punishment” is a constant entry. We have been unable to find an explanation for this and considering that the ship was in action during this time it seems most unusual. One possible explanation is that the ship’s crew had learned of their previous skipper’s death when the steamship Nellore was torpedoed while returning to New Zealand in June 1944. This fits with the dates. We do know that Lieutenant Ewan Cameron was well liked and highly regarded by all the crew. We also know from personal testimony that at least three crew members came to New Zealand and settled here. They all made mention of their Captain’s recommendations regarding his homeland and these were a factor in their decision to emigrate and there is no doubt that most of the crew were on warm terms with him. It is our conclusion that there may well have been an incident involving the crew probably while ashore. We do not know (yet). Should anyone be able to supply extra information regarding such an incident we would be delighted to hear from you.